Our pairs make a typical investment of $5000 for their wedding photography. Contact us for a complete price list, to discuss the many options available and to build a custom package just for you and your special occasion. We love walking into our clients homes and seeing the photographs that we have created displayed in an album on the coffee table or hung on the walls. The images come to life outside the computer. These are the keepsakes that will be around for generations. We will be cleaning our children’s grubby fingerprints off them, they will be pulled out on our 40th wedding anniversaries and we will reminisce about how young we all were. They will help us to tell the story over and over again about so and so forgetting the rings and using our parent’s rings instead, when that crazy neighbor next door got a little enthusiastic on the dance floor and flattened the cake and how as dad walked you down the aisle you glanced at your bridesmaids and every single one of them had tear filled eyes. 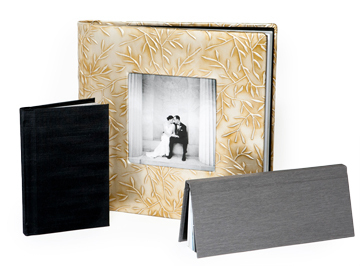 Our albums are awesome and we cannot wait to share the options available with you! They range from fun and funky to beautifully traditional. When you get your hands on one of our samples you will not want to let go. We design your album with the same approach we have to photographing your event. It is unique, its is custom and it is your wedding story. Other fun products that we offer include professional prints, gallery wrapped canvases, standout prints, prints on metal and prints mounted on a bamboo panel.